A bit of a change from Tuesday’s red dress, I know, but i like to show all sides of myself with clothes, as we all do. I was recently contacted by Sylca Jewelry, a wonderful mother/daughter company that offers unique, beautiful, eco-friendly pieces that will take your outfit to the next level! I spoke with Camila, and she was so lovely and wonderful to work with . Customer service is superb. I picked out a necklace and earrings, and I have to say, it was challenging as I loved so many of their pieces. They sent the pieces and within two days I received them. I truly appreciate that point of view and inspiration, where one is brought up to follow one’s passion. I did so with music when I went to school for jazz guitar. My parents both encouraged me to follow my passion, and it shows in their designs. 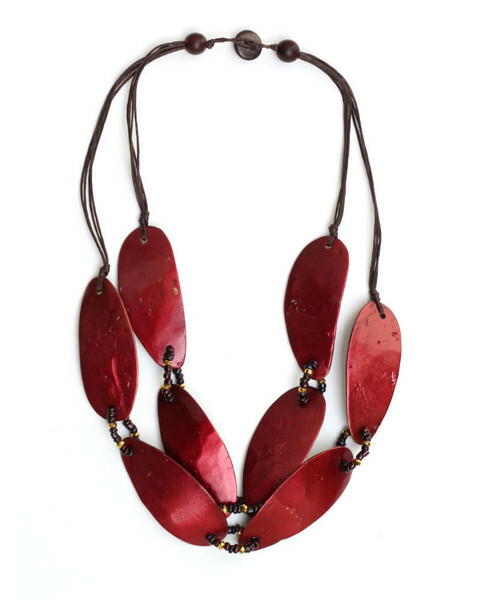 One can tell by the intricate design and love of nature with pieces made of wood, shell, vegan materials, and natural dyes. I also love that with each purchase they donate to help Filipino women in need. So, beauty, nature, eco-friendly, and helping others. Sold! Read more about the ladies HERE. On to the piece I chose. As I mentioned, and as you know, I love jewelry. I have unique, one of a kind pieces, vintage and antique jewelry, pieces from Artisians, a love for wood jewelry, and especially love designs from nature. I find serentiy most, when I am in the mountains. Hiking or being in nature is calming to me. After going through the pages several times, but remembering the bronze piece I saw on their INSTAGRAM account, I decided that was the piece for me. I loved the bronze color, the vegan leather strands, seeds dipped in bronze, along with the black shapes for added structure and interest. 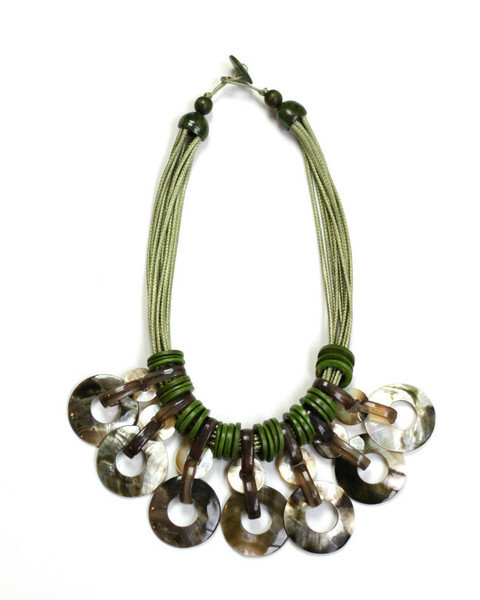 I loved this piece as a neutral pieces that can be worn with anything. 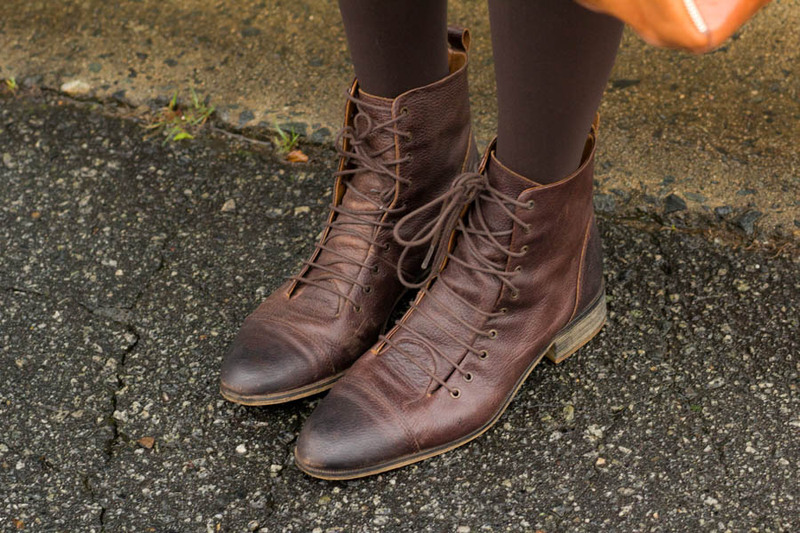 I had in mind these weathered, distressed brown leather booties that look like they are from the early 1900’s. ( found on Ebay from ZARA) and wanted to style a menswear look with a Elegantly Dressed and Stylish twist. A “Feminine” mens-wear look with the green tweed mini skirt, peppered with yellows, browns and dark green threads, ruffled mustard yellow blouse, and fitted brown plaid vest. Add the Rebecca Minkoff cognac leather handbag. Got to make it girly! The necklace was the inspiration for this look. 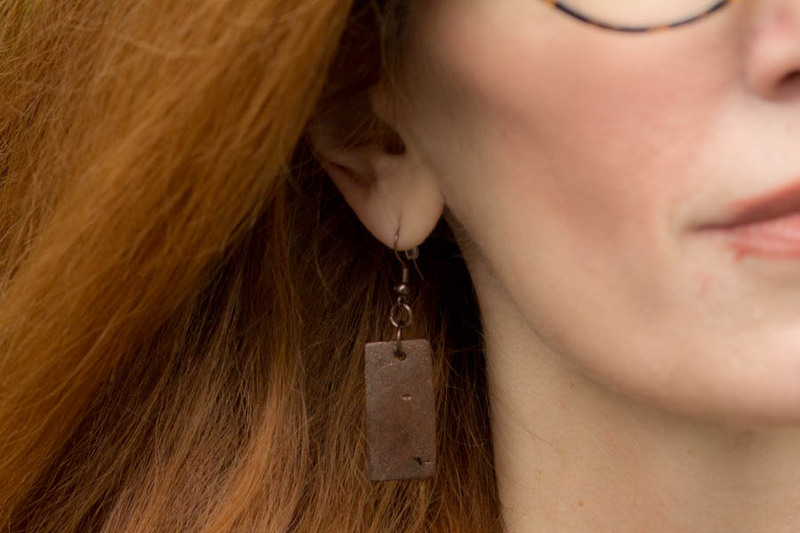 The bronze SYLCA piece added such texture to the look with all of the fall colors, as well as the beautiful rectangular bronze dangled earrings. The spirit of fall! Wow! Loved the outfit, jewelry et al! What an amazing necklace and you styled it perfectly! Love Sylca! I love the mix of autumnal colours and different textures. The waistcoat is fabulous! Oh wow, for some reason this is one of my favorite posts you’ve published! I love the colors, the jewelry, the natural way everything comes together! It looks comfy, classic and so uniquely fall! 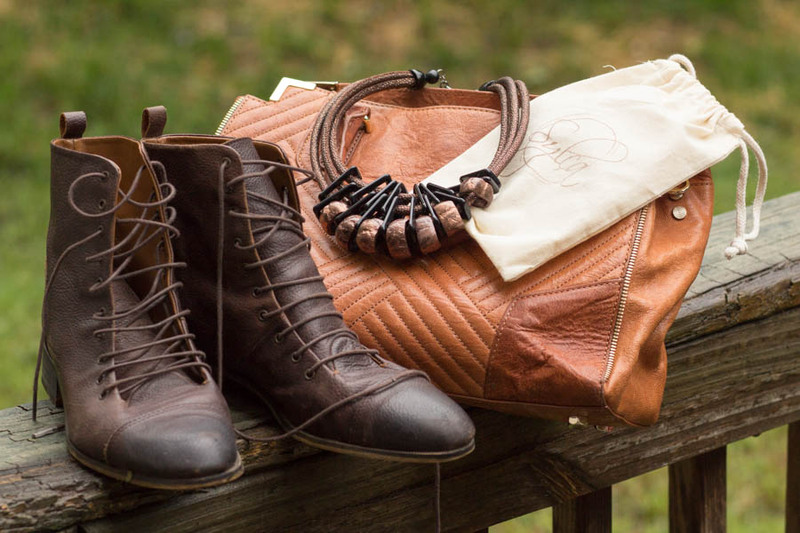 Love all the fall colors in this outfit and loving those great boots! I love the whole look of your outfit. Textures, colours, shapes are all great. I’m going to drag my hubby’s waistcoats out and see what I can team them up with. This is such a unique colour scheme. Really gorgeous. I especially love this shade of yellow. This look is so pretty for autumn! Those colors are beautiful and I am really loving your boots, too! The color combination is outstanding, Jess! 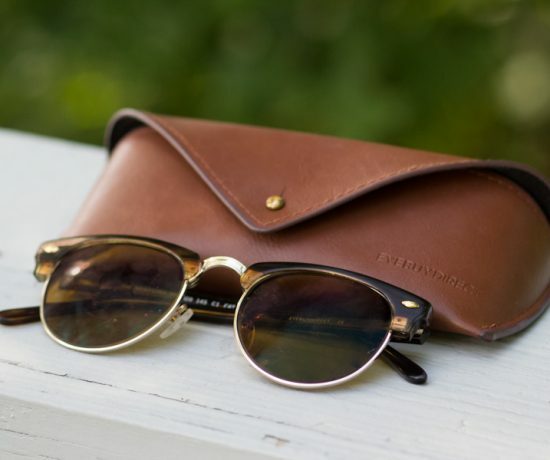 Thanks 4 linking up to Top of the World Style. I want the skirt and the vest! This outfit is awesome! Loving the rich Fall colors here Jess. The mustard especially pops. And that necklace is gorgeous! Jess~ This such a fab look…it’s like super cool vintage college professor! And the colors are phenomenal on you.? You look great in autumn colors and necklaces they are stunning. What a great ethos behind the company and how lovely you’ve been able to work with them. Always inspiring to hear of such female entrepreneurs/family businesses who are making a difference on many levels especially helping Filipino women. I love the balance between the masculine of the boots and the waistcoat with the feminine of the ruffle in the top, the skirt and the necklace. But I really love how the tones of the necklace match so well the the colours of the boots. That just ties it all in. A great look on you Jess. you look amazing! love all the autumn colors! Those boots are great and that nail color is on point! This has a great vintage vibe! Love the mustard yellow with the olive green skirt. I love this look! All of these colors work so well together! This is a perfect Autumn look! I love your colour palette….so rich and expensive-looking. The mustard is fabulous against your skin (and of course your fiery hair is just made for this time of year!). I am coveting your fabulous skirt…and those boots!! LOVE. The little touches really make this look special, quality tights in a muted tone, your beautiful nail colour. Jess, you have such an eye for detail. As for that necklace….what a stunning choice. I love the ethos, but more than that the I love the LOOK… both geometric and organic, a real find…perfect!! Love the necklace you are wearing, Jess and you look great in the mustard color! Hi Pam! I think you have collaborated with them if I can remember They are such a great company! Glad you liked my choice and have had this top for a few years, but decided to pull it out for this look!